This week the TrekRanks Podcast crew dives deep into those select episodes that when you first watched them, for some reason or another you just didn&apos;t connect with them and weren&apos;t very fond of them. But in time, they become the Episodes You Grew to Love. Our panelists highlight quite a few episodes that you might never thought you hear on a "Best of Trek" list. 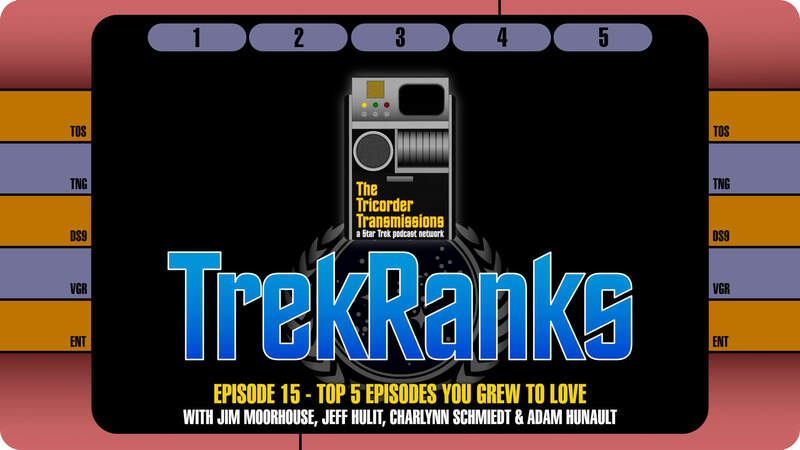 TrekRanks host Jim Moorhouse is joined by Jeff Hulit, Adam Hunault and Charlynn Schmiedt to reveal a number of surprising picks. This week&apos;s show featues some of Trek&apos;s most maligned episodes, and perhaps more surprisingly, some episodes that are hailed among Trek&apos;s all-time best. The 20 overall picks lead to another great episode for fans of deep cut Trek selections. With no need for a Diagnostic Cycle this week, our four-person panel jumps straight into breaking down how they made their picks (and what it took them to come around) in our Prime Directive section. The crew then compiles The Order of Things by revealing their "Five Word Summary and Hashtag" for each of their Top 5 Episodes You Grew to Love. The resulting discussion will feature picks that are sure to surprise. After a quick recap of all the picks in the Regeneration Cycle, the episode concludes with a visit into a Temporal Causality Loop as we flashback to Episode 14 for listener feedback regarding our Top Five Time Travel Episodes.